Traveling in two vans, 10 students, a teachers' assistant and two professors are following the course of California water. University of California students are taking a long journey through California to trace the state's complicated and critical water supply. The recent graduates and upper-division co-eds from UC Merced, UC Santa Cruz, UC Berkeley and UC Davis are part of the UC Water Academy, a course that combines online training with a two-week field trip for first-hand knowledge about California water. Ten acres at Kearney are set aside for organic research. Summaries of presentations from the 2016 Organic Agriculture Research Symposium (OARS) held in Pacific Grove are now available online at http://eorganic.info/node/16778. Many of the workshops and keynote presentations were recorded live and may be viewed via the eOrganic YouTube channel. 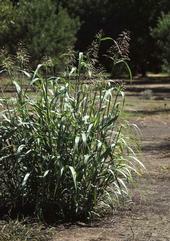 Johnsongrass, one of the most troublesome weeds in the world, is closely related to sorghum, which is grown for food, fodder and biofuel. A team of researchers has received a $5 million grant from the U.S. Department of Agriculture to find new ways to combat Johnsongrass, one of the most widespread and troublesome agricultural weeds in the world.